Two ancient, dead bodies have been dug up from the moss, along with objects with unfamiliar inscriptions. The wine connoisseur and decryption expert Fredric Drum is called and suddenly finds himself in the center of mysterious and dangerous events. The excitement builds on the appearance of an old hunter amulet; a doll. 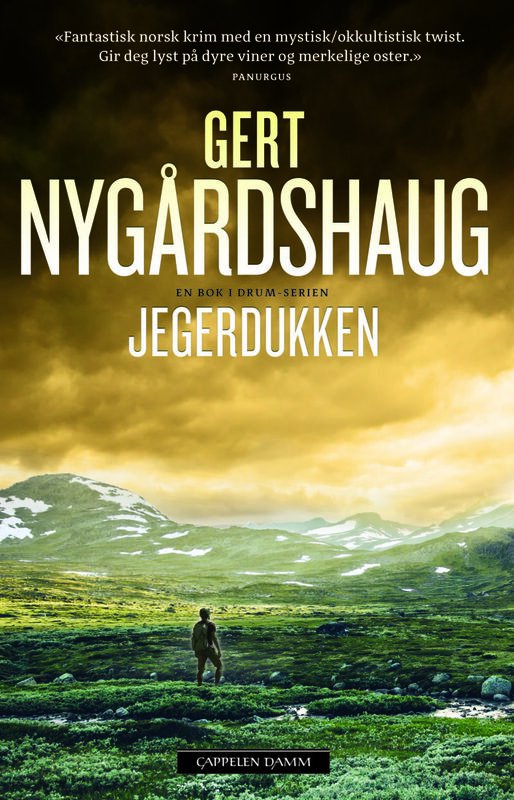 Gert Nygårdshaug brings the reader into a world where trout fishing, magnificent nature, archeology and myths merge into a high-end drama. Amazing norwegian crime with mysterious and occult twist. Dinner is served! An extraordinary investigator enters the crime scene: Fredric Drum! The prose is even and fluid. if a film, the photography would be stupefying. An ecologist and esoteric thriller from the Norwegian forests, focused on finding an ancient doll that brings luck and trouble. Interesting, also as a study of the North-European images. I have finally found a crime hero which is original, new, alternative and really interesting! (...) The plot is original, well thought out and many threads woven into an intricate pattern and a perfect ending. This novel has many reasons for beng recommended: Fredric Drum´s sweet character and good taste in wine and food (...) The description of Norwegian nature (...)Both the protagonist and the rest of Nygårdshaug´s gallery of personalities (...) The page turning drama. A masterfully written novel, not to be missed. A seductive hero. Written with loving references to Conan Doyle and exalts the quality of a mysterious, captivating, engaging, convincing, original and surprising text. I recommend this story! Which, among other things, is particularly suitable for those who do do not run the risk of incurring excessively violent scenes, this novel is stimulating on a more psychological level. An unusual and out-of-the-box thriller (...) which I liked a lot because it is different from the usual and because it is full of information that enriches the novel but also the reader (...) thanks to the very fluent and detailed writing of the author, L´Amuleto manages to become a great novel with a final to say the least; surprising.